One of our largest fundraisers of the year, the book sales offer thousands of donated books for all ages and interests as well as audiovisual materials. You can drop off donations at the Washougal Community Library to our book nook. You can help set up, organize or keep books neat during the book sale and answer questions. We also need help with clean up following the book sales. Thank you for joining us for another successful sale! Join us and choose from a huge selection of reading material. 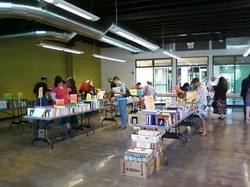 Setting up for our book sale.